How often does OI-10 cross Chestnut Ave ? 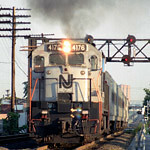 Conrail Blue wrote: How often does OI-10 cross Chestnut Ave ? The job works M-F, with the bulk of the traffic being for Oasis Foods just west of Chestnut. They will sometimes cross Chestnut while switching Oasis (if there are a lot of cars); but they will also cross when heading to Irvington to run around their train for the trip back down the branch, or if they have cars for the paper company in Irvington (the only customer remaining north of I-78). Lately it seems that most days they do the run around move, but it is not always necessary. Do you know the name of the paper company in Irvington? I gleaned out two boxcars spotted between the warehouses in Irvington while driving by. It was nice to see a customer up at the end of that line. The big yard at the end of the line was empty. Do you know the name of the shipper in Irvington? That's alright, I'll have to take a ride up to that area. I am looking for information on the age of this branch. Specifically any maps/figures/or historical accounts. I am doing some work at a property that was historically serviced by the line (a few buildings east of the old Bristol Myers Squib plant, and on the north side of the line). I have some good pictures that I'll try to upload for your viewing pleasure. I used to work at Kaiser Alum in Hillside the building east of Bristol Myers. The tracks went thru our plant and we received carloads from various plants thru out the Kaiser System. The building is now known as Hillside Plastics at 200 Rt 22. There were about 3 deliveries per week. This continued to around 1987 and in 1989 Kaiser sold the property to Hillside Plastics. The deliveries beyond us were Pabst brought up to a team track in Irvington, Oasis Foods not sure if that was the name then. In addition in Irvington, Manufacturers Reserve Supply which is still on Woolsey Street and may still be receiving cars. This is a post back from 2008, the building just east of Bristol Myers was Kaiser Alum now Hillside Plastics and this is some of the activity back from 1976 to 1989 when I was working at Kaiser. Is it J & M Cummings Paper Co. in Irvington that receives those box cars? I think Manufacturers Reserve Building Supply in Irvington on Woolsey St receives occasional lumber cars. Joseph DeLuisi wrote: Is it J & M Cummings Paper Co. in Irvington that receives those box cars? Joseph DeLuisi wrote: I think Manufacturers Reserve Building Supply in Irvington on Woolsey St receives occasional lumber cars. Possibly, but I see the local almost every day and have not seen a loaded lumber car head up the branch in a very long time. Thanks for the info, it's good to hear that the paper company gets boxcars occasionally. I have an interesting update on the branch. There has been a rail train active on the line over the last two days. The power is CSX ES40DC 5444, certainly the largest power I've seen on the line in the last 10-15 years! The crew dropped several long segments of welded rail between Liberty Ave and Hillside Ave. This location was chosen as this is one of the longest stretches on the line without grade crossings. It will eventually be used to replace most of the existing rail on the branch. The rail itself is relay rail that is being "recycled" from other lines. So the line is finally getting a much needed upgrade. It should be interesting to watch this process.